North Carolina’s booming agriculture industry is as varied as the state’s geography. 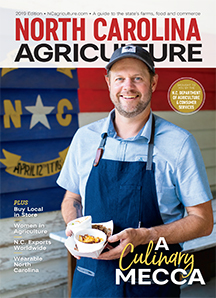 From the towering Appalachian Mountains to the Coastal Plain, North Carolina’s climate and landscapes allow for a bounty of agricultural products. The state ranks first in the nation in farm cash receipts for tobacco and sweet potatoes; second for poultry and eggs; and third for pork and trout. Along with these commodities, North Carolina’s hardworking farmers produce cotton, soybeans, peanuts, hogs and pigs, nursery products, aquaculture products, and more. But North Carolina agriculture is more than just commodities. Agritourism, agricultural exports, healthy eating incentives and research are just a few of the other aspects of the state’s industry. About 49,500 farms spread across 8.4 million acres of land across the state, with each farm averaging about 168 acres in size. All these farms strongly contribute to agriculture’s economic impact on North Carolina, which rings in at $76 billion annually. Producers spend years cultivating the perfect harvest for certain specialty crops. 4-H and FFA help prepare the next generation to take on careers in the agriculture industry. N.C. retailers stock local products on the shelves. The sky is the limit for farmers using drones. Braswell Family Farms looks forward to continued success. Discover what makes North Carolina cuisine stand out in the crowd. 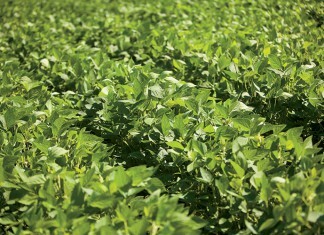 New uses for Indiana soybeans boost markets for state's farmers.